Components and sulfur isotopic compositions of pyroclastic materials from the 2014 Mt. Ontake eruption were investigated. The volcanic ash samples were found to be composed of altered volcanic fragments, alunite, anhydrite, biotite, cristobalite, gypsum, ilmenite, kaolin minerals, native sulfur, orthopyroxene, plagioclase, potassium feldspar, pyrite, pyrophyllite, quartz, rutile, and smectite, and most of these minerals were likely derived from the acidic alteration zones of Mt. Ontake. The absence of juvenile material in the eruptive products indicates that the eruption was phreatic. The sulfur isotopic compositions of the water-leached sulfate, hydrochloric acid-leached sulfate, acetone-leached native sulfur, and pyrite of the samples indicate that these sulfur species were produced by disproportionation of magmatic SO2 in the hydrothermal system at temperatures of 270–281 °C. This temperature range is consistent with that inferred from the hydrothermal mineral assemblage (e.g., pyrophyllite and rutile) in the 2014 pyroclastic materials (200–300 °C). Except for the sulfur isotopic compositions of anhydrite, which may have been altered by incorporation of sulfate minerals in a fumarolic area with lower sulfur isotopic values into the underground materials during the 1979 eruption, no significant differences in the mineral assemblages and sulfur isotopic compositions of the pyroclastic materials were identified between the products of the 2014 and 1979 Ontake phreatic eruptions, which suggests geochemical similarities in the underlying hydrothermal systems before the 2014 and 1979 eruptions. Mount Ontake (35°53′34″N, 137°28′49″E; Fig. 1) is the second highest volcano in Japan (elevation: 3067 m). Few phreatic eruptions have been reported around the Jigokudani and Hachotarumi areas in recorded history (Oikawa 2008). On September 27, 2014, this volcano suddenly erupted pyroclastic material and volcanic gases. The craters formed in 2014 occurred in a different location from the previously formed craters of this volcano (Kaneko et al. 2014). The abundance of hydrothermal minerals such as anhydrite and pyrite, as well as the lack of juvenile material in the eruptive products, indicates that the 2014 eruption was essentially phreatic in nature (e.g., Ikehata et al. 2014; Imura et al. 2014; Miyagi et al. 2014; Nakada et al. 2014). Sulfur isotopes have been used as geochemical tracers and temperature indicators for volcanic hydrothermal systems (e.g., Sugiura et al. 1980; Kusakabe et al. 1982; Ossaka et al. 1983; Williams et al. 1990). Kusakabe et al. (1982) reported sulfur isotopic compositions of anhydrite, pyrite, and native sulfur in pyroclastic materials from the phreatic eruption of Mt. Ontake on October 28, 1979. These authors concluded that some of the anhydrite and native sulfur were formed through the disproportionation reaction of sulfite produced by dissolution of magmatic SO2 into water in the mud reservoir below the crater zone. On the basis of the sulfur isotopic compositions of volcanic gases emitted during the 1979 Ontake eruption, the underground temperature of the crater area in 1979 was calculated to be higher than 250 °C (Ossaka et al. 1983). In this paper, we present sulfur isotopic data of sulfur-bearing minerals and components in the pyroclastic materials from the 2014 Ontake eruption to elucidate the geochemical characteristics of the underlying hydrothermal system. Pyroclastic materials from the 2014 Ontake eruption were collected in the morning of September 30, 2014, from two locations near the Kanose hot spring, about 8 km east-northeast of the Jigokudani area of Mt. 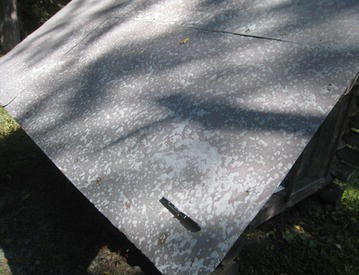 Ontake: OT-1, a roof of garden shed at the hot spring (Figs. 1, 2), and OT-3, a roadside garbage box located about 400 m north of the hot spring (Figs. 1, 3). The thickness of the pyroclastic material deposited near the Kanose hot spring was about 1 mm (Fig. 4). 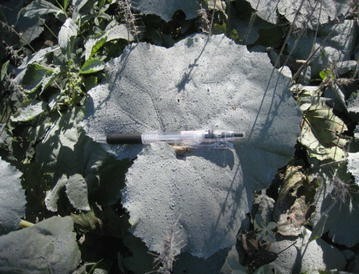 The collected samples were unaffected by rainwater. X-ray diffraction (XRD) analyses were conducted to identify minerals in randomly oriented bulk sample (OT-3) and air-dried oriented clay fractions (<2 µm) separated through elutriation from the OT-3 sample. 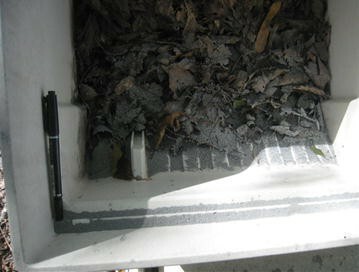 The clay-fraction samples were also examined with XRD after various treatments were applied (ethylene glycol treatment, HCl treatment, and heating at 500 °C). Thin sections and epoxy mounts of selected samples were also prepared for petrographic studies and electron probe microanalysis (EPMA). About 20 g of each of the bulk ash samples (18.9 and 20.9 g of OT-1 and OT-3, respectively) was soaked for 12 h in 800 ml of 18 MΩ deionized water. The supernatant liquid from each sample was then separated from the H2O solution through filtration using mixed cellulose ester membrane filters with pore sizes of 0.2 µm (Advantec Tokyo, Japan). The H2O-soaked ash samples were then rinsed with deionized water twice. To ensure oxidation of elemental sulfur, 5 ml of 30 % hydrogen peroxide was added to each of the remaining solutions. These solutions were acidified to a pH of about 3 by adding 2 N HCl. Forty milliliters of 10 % BaCl2 solution was added to the solutions to precipitate barium sulfate. The barium sulfate samples precipitated from the H2O solutions (water-leached sulfate, H2O-S) were collected through filtration and rinsed with deionized water. The H2O-soaked ash samples were treated with 150 ml of 2 N HCl for 2 h at 80 °C. After membrane filtration, the pH of each solution was adjusted to about 2 through the addition of 6 N KOH; 20 ml of 10 % BaCl2 solution was then added to the HCl solutions to precipitate barium sulfate. The barium sulfate samples precipitated from the HCl-treated solutions (hydrochloric acid-leached sulfate, HCl-S) were collected through filtration and rinsed with deionized water. Pyritic sulfide samples (Pyrite-S) were collected from a portion of the acid-treated ash samples (about 2 g) through a density separation method using 1,1,2,2-tetrabromoethane (2.967 g/cm3). Hundred milliliters of acetone was added to the remaining portion of the HCl-treated ash samples. The acetone solutions were filtered with glass fiber filters (GC-50, Advantec, Tokyo, Japan) and dried in a vacuum chamber at 0.02 MPa at room temperature to obtain evaporated residue of elemental sulfur from the acetone solutions (acetone-leached native sulfur, Native-S). Sulfur isotopic compositions were determined for the barium sulfate precipitates and the pyritic and elemental sulfur using a helium gas continuous-flow isotope ratio mass spectrometer (CF-IR-MS; Isoprime-EA; Isoprime Ltd., UK) at the University of Tsukuba (see Maruoka et al. 2003a). The samples were weighed in 3.3 mm × 5 mm tin capsules, and 200–300 μg of V2O5 was added to each sample. The tin-wrapped samples were introduced into a combustion/reduction quartz tube with an autosampler and were heated at 1070 °C with a helium gas flow of 120 ml/min. The samples were then oxidized with pulses of oxygen. The combustion/reduction tube contained tungstic trioxide to promote the complete oxidation of the samples and pure copper wires to remove excess oxygen and to convert sulfur trioxide to sulfur dioxide. The water produced during combustion was removed by a water trap of magnesium perchlorate. The gases were then introduced into the quartz tube, which contained quartz wool, and held at 890 °C to minimize the oxygen isotope variation of the SO2, with a SO2–SiO2 equilibrium reaction (Fry et al. 2002). Sulfur dioxide and other gases, such as CO2 and N2, were separated through gas chromatography. These gases were then introduced with continuous flow of helium into the mass spectrometer through an open-split interface. The sulfur isotopic compositions are expressed in terms of δ34S (‰) relative to the V-CDT (Vienna-Canyon Diablo Troilite) standard. The results of three IAEA (International Atomic Energy Agency) silver sulfide standards (IAEA-S-1, −0.3 ‰; IAEA-S-2, +21.80 ‰; and IAEA-S-3, −31.95 ‰; Mayer and Krouse 2004) were compared to constrain the δ34S values. The isotopic compositions of sulfur were determined to a precision of ±0.1 ‰ (1σ) for 30 µg of sulfur. Precisions were determined based on a combination of the standard deviations from repeated analyses of the samples and standards (Maruoka et al. 2003b); the sample analyses were repeated at least four times. 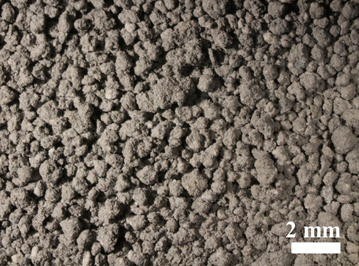 The collected samples (OT-1 and OT-3) consisted of spherical aggregates of grayish fine volcanic ash (Fig. 5). 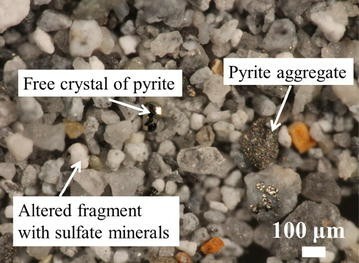 Stereomicroscopic observation of these samples revealed the presence of clay minerals, hydrothermally altered fragments with sulfate minerals and pyrite, and free crystals of pyrite, feldspar, and silica mineral in both the samples (Fig. 6). No juvenile materials were found in the samples. Alunite, anhydrite, biotite, cristobalite, gypsum, kaolin minerals, plagioclase, pyrite, pyrophyllite, quartz, and smectite were identified with XRD analyses of the randomly oriented bulk sample (OT-3) and oriented clay fractions of the OT-3 sample (Fig. 7). Ilmenite, orthopyroxene, potassium feldspar, and rutile were also found in OT-3 by EPMA analysis and polarizing microscope observation. These hydrothermal minerals are commonly found in acidic alteration zones of active geothermal areas and sulfur fumaroles (e.g., Utada 1980; Hedenquist et al. 1996). Cristobalite and kaolin minerals are low-temperature (i.e., less than 200 °C) acid-stable minerals, whereas pyrophyllite and rutile are relatively high-temperature (200–300 °C) acid-stable minerals (Hedenquist et al. 1996). Most of the hydrothermal minerals of the Mt. Ontake 2014 eruptive products were also reported from pyroclastic materials of the 1979 Mt. Ontake phreatic eruption (e.g., Sugiura et al. 1980; Ossaka et al. 1983), which suggests similarity in the temperature ranges of the hydrothermal systems of both eruptions. Sulfur isotopic compositions of sulfur from the water-leached sulfate (H2O-S), hydrochloric acid-leached sulfate (HCl-S), acetone-leached native sulfur (Native-S), and pyrite (Pyrite-S) from the collected samples (OT-1 and OT-3) are presented in Table 1 and Fig. 8.
where αanhydrite-pyrite represents the isotope fractionation factor between anhydrite and pyrite. This temperature range is consistent with those inferred from the hydrothermal mineral assemblage (e.g., pyrophyllite and rutile) of the 2014 pyroclastic materials (200–300 °C) (Hedenquist et al. 1996), as well as the underground temperature of the 1979 crater area calculated based on the sulfur isotopic compositions of volcanic gases related to the 1979 Ontake eruption (more than 250 °C; Ossaka et al. 1983). These ranges are lower than the sulfur isotopic equilibration temperatures of the 1979 eruption (314–394 °C) calculated based on the sulfur isotopic values of HCl-S and Pyrite-S (Kusakabe et al. 1982) with Eq. 3. Sugiura et al. (1980) and Kusakabe et al. (1982) suggested that these temperatures are unrealistically high for the underground mud reservoir of the 1979 eruption because the clay minerals would be unstable at such high temperatures. They attributed this discrepancy to the incorporation of sulfate minerals with lower sulfur isotopic values [e.g., a gypsum sample (δ34S = + 5.1 ‰) from a fumarolic area of Mt. Ontake] into the underground materials. The pyroclastic material of the 2014 Mt. Ontake eruption was composed of altered volcanic fragments, alunite, anhydrite, biotite, cristobalite, gypsum, ilmenite, kaolin minerals, native sulfur, orthopyroxene, plagioclase, potassium feldspar, pyrite, pyrophyllite, quartz, rutile, and smectite. Most of these minerals were likely derived from the acidic alteration zones of Mt. Ontake. The absence of juvenile material in the eruptive products indicates that the eruption was phreatic. The difference in sulfur isotopic values between anhydrite and pyrite from the 2014 eruption indicates isotopic equilibration temperatures ranging from 270 to 281 °C. This temperature range is consistent with that inferred from the hydrothermal mineral assemblage (e.g., pyrophyllite and rutile) of the 2014 pyroclastic materials (200–300 °C). With the exception of the sulfur isotopic compositions of anhydrite, which may have been altered by the incorporation of sulfate minerals in a fumarolic area with lower sulfur isotopic values into the underground materials during the 1979 eruption (Sugiura et al. 1980; Kusakabe et al. 1982), no significant differences in the mineral assemblages or sulfur isotopic compositions of the pyroclastic materials were observed between the 2014 and 1979 Ontake phreatic eruptions, which indicates geochemical similarity in the hydrothermal systems below the crater before each of these eruptions. IK carried out the sample collection, sample description and drafted the manuscript. MT performed the sulfur isotope analysis of the samples and helped draft the manuscript. Both authors read and approved the final manuscript. We thank two anonymous reviewers for their constructive comments and Dr. Teruki Oikawa for editorial assistance. This work was partially supported by a grant from the Program to Disseminate Tenure Tracking System of the Ministry of Education, Culture, Sports, Science and Technology (MEXT), Japan.